I move through the sanctuary very slowly, aware of the way my weight shifts to the balls of my feet. I’m meant to be moving like this. My friend Meghan has been leading us in a dance exercise, helping us to become aware of the kinesphere, that circle of energy that surrounds our bodies, the energy that makes us aware of someone coming into a room even when we don’t turn our heads to look at them. We each have a kinesphere, she says, and we meditate, standing, breathing in and out and feeling internal energy grow within us, from a small flame behind our navels up and out through our limbs into the spaces that surround us. And then we walk, slowly at first, increasing our awareness of the space that we’re in, the sanctuary, with its crowded chairs and altar on a dais, and doors that open to older and less beautiful spaces, alleyways and much-used kitchens. I become aware of the windows on the door that leads into the lobby, and I walk towards them, watching the light shift on the textured glass, the contrasts change from pools of darkness to contours of light that allow the colors to rise, as if they’re bubbling up from a hidden depth. My work is concerned with the expansion and extension of our senses into rarified zones of perception that exist between imagination and hallucination. 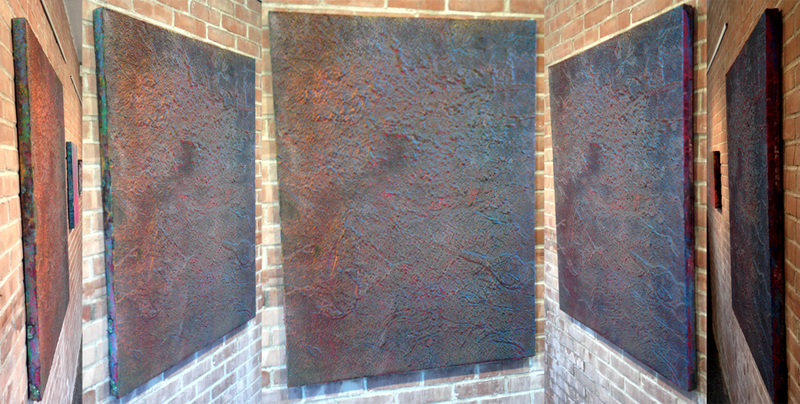 My paintings are doused in dirt, clay, dried powders, plaster and acrylics. They are encrusted in the studio floor and pried from the walls. The studio (as much as the materials) becomes a medium through which I can access strange forms of vision and magnify otherwise liminal experiences. I use lights, patterns, and colors to test the limits of my knowable perceptions in order to develop sensitivity to that which I have yet to understand. The body of work I have submitted represents a new vision of living paintings that shift both spatially and temporally. The surface is raised, pulled forward, and balanced at the threshold of flatness and dimensionality. As you move in any direction, the paintings move with you. By expanding this interval (or zone of interactivity) between viewer and painting, the notion of a prescribed vantage dissolves. The paintings exist as you exist, changing as your eyes and body adjust and change, and fading as we all fade. These paintings have been working on me, making me aware of the shifting nature of the physical world. I have always understood two-dimensionality better than three-dimensionality. My mind translates the world I see into flat surfaces – photographs, drawings, watercolor paintings. Now I wonder if this is a strategy of avoidance, a way of denying a connection to the physicality of my environment. If we all have kinespheres, then our presence in any room subtly alters that room. And maybe not just in terms of energy or spirit. What if the world, like Michael’s paintings, changes as we change – changes because we change. The territories that Michael’s paintings invite us into are places where the landscape shifts because of our presence in it. But this is true of all landscapes. Why is this so easy to ignore, until that moment when a painting makes it palpable? At the opening, Michael kept taking one of his paintings off the wall and turning it in the light. The colors shifted as it turned, as light from the tracks above illuminated different ridges of paint and shifted across the painting’s contours. Those contours seemed to move with the light. I’m most drawn to the largest painting in the show, a painting whose colors are brass and blue. If I start to the left of the painting I see a field of gold and reddish hues in the center of the canvas. As I move to the right, the center loses its distinction, the reds drip downward, and thin waves of blue begin to rise along the ridges of paint. Finally I come to the far right, and the brass is almost wholly subdued. A few sparks of red remain, but the blue has imposed a kind of silence. To sit before this painting is to commune with something beyond yourself. I know that it’s only paint, and mud, and clay, and plaster. But it seems alive. More than that, it announces the life of its materials, and points beyond them to all physical objects. It suggests that the whole world is alive – the buckled glass on the chapel door, the pattern of shadow on the weathered maple tree outside the window, the perpendicular grooves on the column of the lamp post beside it. And if these things are alive, they have their own kinespheres, their own zones of energy and being, that subtly change and alter, grow and dwindle, depending on our interactions with them. This suggests an ethic, a way of being in the world. We can grow or narrow our kinespheres. We can choose to make ourselves less present, in deference to the presence of others. Meghan tells us to come back towards the center of the room. At her direction, we begin to move quickly, to weave between each other. She tells us not to avoid each other, but to fill the gaps between the moving dancers. Those gaps become smaller and smaller. We have been expanding, but now we are shrinking, and our kinespheres blend with each other, like overlapping waves of tinted light. We are doing this exercise as a way of responding to the beatitudes. “Blessed are the poor in spirit, for theirs is the Kingdom of Heaven. Blessed are the meek, for they will inherit the earth. Blessed are the pure in heart, for they will see God.” We accept the smallness of our kinespheres, the diminishment of our energies. We accept it meekly, because such acceptance is a path to awareness. An awareness of other people and other things. A desire to honor their energies, to blend with those energies, to avoid overwhelming them. It’s an attempt at a kind of purity, an attempt at cultivating pure generosity, a response to the pure grace of other things. It’s a form of blessing. We bless the physical world with our awareness, and the physical world blesses us. In the end, this blessing becomes a kind of territory that we, person and painting, dancer and glass, have created between us. To have that circle of energy around each of us is so mystical and so beautifully shared. I agree. I wouldn’t want it to be something we exploit, though. I’d rather give my energy away. Beautiful imagery, Karl. I especially like “It suggests that the whole world is alive – the buckled glass on the chapel door, the pattern of shadow on the weathered maple tree outside the window, the perpendicular grooves on the column of the lamp post beside it.” I couldn’t agree more! Beautiful imagery and ideas, Karl. I especially like ” It suggests that the whole world is alive – the buckled glass on the chapel door, the pattern of shadow on the weathered maple tree outside the window, the perpendicular grooves on the column of the lamp post beside it.” – I couldn’t agree more! Some older terms for this are nimbus and aura. You’re absolutely right. But I wonder why dancers have chosen a different phrase. Probably because kinesphere evokes energy and movement, whereas a nimbus or aura could be simply static?